I have told my kids that one optimistic yet�realistic�way to look at life is�that it is like standing in front of�a conveyor belt upon which a stream of opportunities are passing by, but each one will�never pass by�again in the same form. I am referring to every sort of opportunity: opportunities to make friends, to be kind, to find love, to have fun, to stand up for your beliefs, to show mercy, to develop interests, to develop good habits of character, to make money, to be forgiving, to practice strength, to find God, to learn, etc, etc. Alas, that conveyor belt offers just as many opportunities to make mistakes and poor choices. It is a tough�part of maturity to accept the reality limitation, however,�that any opportunity�grabbed will reduce�the number�of opportunities passing by on the conveyor belt, because time is an arrow. God replies "I sent you a firetruck, a rowboat, and finally a�helicopter. You rejected every one..."
Just excellent, BD. 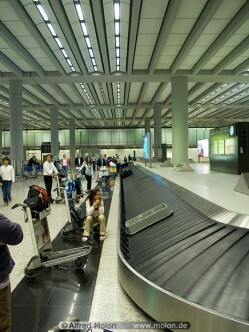 Love the conveyor belt image. The 'tree' image is more intimidating--the idea (true tho it is) that any choice forecloses some others. Thanks! And you are an amateur geologist, too. Same here. Wonder why we never did "rock of the day." Hmmmm. Well, obsidian here at the computer trying to think of a good rock. Gneiss of you to give it some thought, but it sounds as if you've had a couple of quartz of beer already. Enuff quartz, and i never metamorphic i didn't like.